I root for all 915 teams in the playoffs, PHHS is no more Cocky than any of the other winning teams, you sound bitter and a little bit like a female dog, you mad? Don't care! Not a fan of PHHS. Gotta go with San Angelo on this one for the W! I'm all for my EP teams with the exception of PHHS. Way to cocky for a newbie team! The fans may be a little cocky, but you shouldn't hope the players suffer for that. From what I hear the players are disciplined and hardworking. Back all El Paso teams since we have the rest of the state against us. Good luck Spartans! Let's just give some support to all of our EP High School teams. Let's go Rams, Spartans, Aztecs and my T-Birds!!! Good Luck Pebble players and coaches. But those parents and some players have no class. Hope Coached talked to those kids . tThey showed their colors on the Montwood game. Cheering when the Montwood player got hurt , really Sad. Go Aztecs. Where are all those Spartan fans that were all over this board for the last couple of months? Get you some tonight Spartans! Play your heart out and get that W!! Let's show our boys that they have tons of support,parents. Guess the PHHS parents were part of the 300 Spartans ? Montwood put a beat down on them, El Do followed. Welcome to the real 6-A Teams. Good Luck and have a safe trip. San Angelo will rest all their starters and save them for the Area round playoff game. 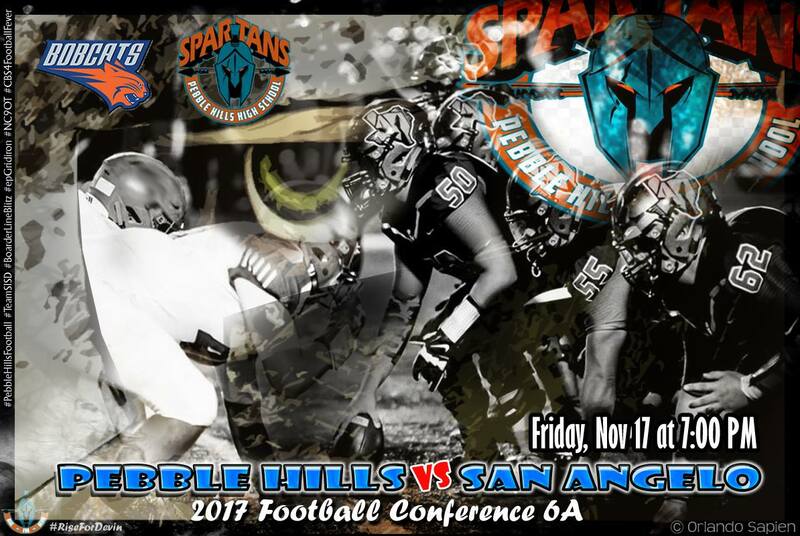 If they rest they're starters it will be an easy win for Pebble Hills. San Angelo has 5-7 starters out with injuries so they can't afford to rest any of the other starters. 35-21 final. PH scored a late TD against the subs. Sloppy game, lots of penalties. Sparty was nervous, 3 straight motion calls on their first possession. SA jumped out to a quick 14-0 lead but PH hung tough and scored on the last play of the half to make it 21-14. Got a little chippy late and one of the defensive guys got to take the rest of the night off after 2 quick unsportsman flags. Did I mention it was sloppy? PH could not run the ball and ended up throwing almost 60 passes. That's not your typical San Angelo team. Most years they would have beaten that team by 60 but they're just not that good this year. I wanted to congratulate Pebble Hills on a great game last night and a great season. The Spartans are a talented team with tons of speed at receiver positions and with a scrappy, accurate QB. Good showing of El Paso fans. I've made that trip to El Paso for games before and it is not easy, so my respect to those who traveled so far to support the Spartans. I hope everyone had a safe trip home. Best of luck to the Spartans in the future. I think they'll match up well against Saint Angelo and will be a very good game. Good luck Pebble Hills. It was a good game, run game for SAC may have made the difference though. We threw the ball well (despite 2 big interceptons, game changers for sure!) they threw well also, but their RB got loose 1 too many times. He scored about a 40 yd td on his first carry in the 2ND half, we never really had a big play out of the backfield. At a point it looked like we were about to break one and got shoe-string tackled. When it's all said and done our boys played a heck of a game. Special teams had a big blocked-punt and I believe one of our DL deflected a pass and got the pick himself. Still, we came up short on offense when we needed it on conversions and +20 a few times that would have made a difference. I can't say SA had the better team, they did some things well but we busted them in the mouth also and had them on their heels into the 4th. We stepped up big on offense, defense, and special teams. Our QB went down in the 4th I think and was out for a few plays which killed our momentum. #10 came back but we didn't regain that spark we needed to ignite like we have in other games. Congrats to the Central Bobcats for advancing in the TX6A FB playoffs. Our fan turn out was ok, but they definitely got louder! That drive is hard, I've had the privilege of attending the Angelo Clinic a few times. Didn't get easier this time, but San Angelo is a nice town so always enjoyable!